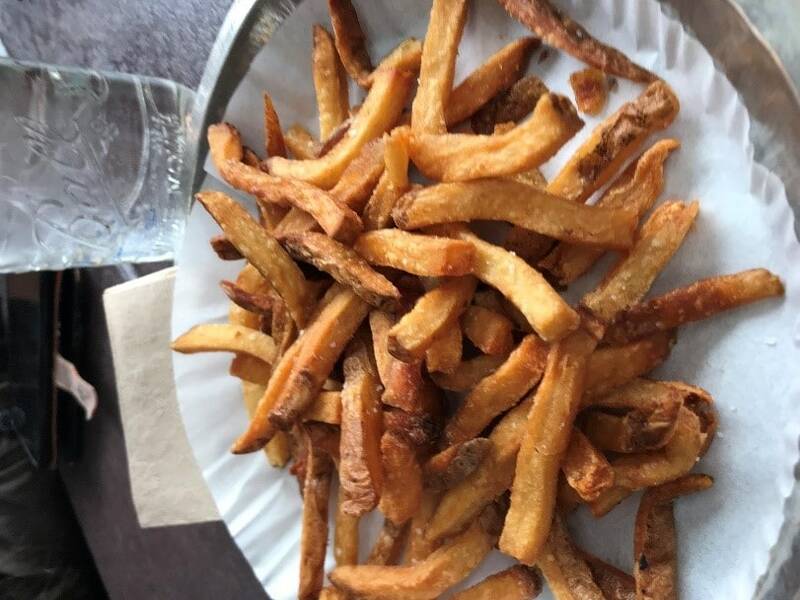 The fries were from 90 count potatoes, which are the usually the sweet spot for the most affordable size of Idaho potatoes to order. They were served in the right kind of container to still look plentiful on the plate. Note, if you put these in a tall cone they might not stick over the top. One thing to think about with your employees... It might be best to have them periodically weigh the portions, so they don't use the large diameter of a flat plate to give customers more than your food cost is calculated at. This looks like a nice value. One way to have the fries look longer and is still usually economical is to use a No. 2 potato, 10 or 12 ounce and above. Many fresh-cut fry chains rely on the No. 2 being a little less cost than a No. 1, but it isn't always the best value if your measure yields are substantially less than buying a No. 1 grade (which should have less defects and more uniform shapes). By the way, these were crunchy, salted just right (might have been cut and placed in a slightly brine salt and water solution) and quickly disappeared at our table. Several orders came out to the group and they all stayed crisp. Look a little closer and I think you'll see what I noticed... Some of the shorter fries or bits and pieces are a little rough around the edges. This can mean that it is time to swap out the French fry blade for a new one. This particular unit was going through 60 cases a week of Idaho potatoes. It doesn't take long for jagged edges or cracks in the fry strips to occur when cutting the potatoes. Each of these cuts will actually break after washing and blanching. This particular variety ordered was the Russet Norkotah and it’s normal for them to fry up slightly darker if stored too cold. The operation actually had them out in the hallway at room temperature to help keep this from happening. Remember, don't store below 40°F or the starch will quickly turn to sugar. Take a look at the French fry cutter blade and treat it just like you would the typical can cutter blade in the kitchen. It should be sharp and not damaged or rough to the touch. Change as needed.